One of my favorite writers and voices on the topic of productivity is Peter Bregman. 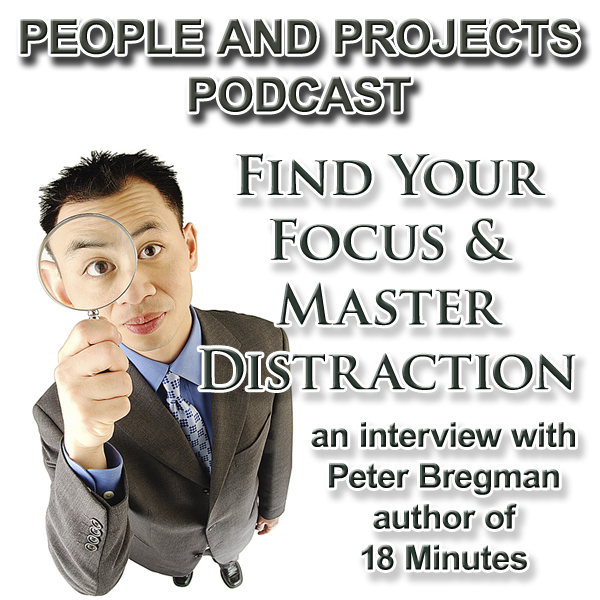 Peter recently released his newest book entitled 18 Minutes: Find Your Focus, Master Distraction, and Get the Right Things Done. I had the opportunity to spend some time with Peter recently and look forward to sharing that discussion with you in this episode. You can learn more about Peter at his website http://www.PeterBregman.com. "I've been listening to your informative and inspiring podcasts and have found value in each one. I like your passion and sincerity. I benefit from the coaching delivered through your discussions with your engaging guests regarding leadership attitudes, skills and practices. I love that you call it the People and Projects podcast. My personal #1 rule is to take care of the people, and your podcasts cover the many dimensions of pursuing that objective. Thank you again for your great podcasts. I look forward to hearing more of them!" I certainly appreciate Cheryl's kind words. Her personal #1 rule is a good one, and is the heart of this podcast. If you get find these discussions valuable I invite you to take a moment and let some friends and colleagues know about The People and Projects Podcast. You can find us on the web, iTunes, and on Facebook. Speaking of Facebook, please take a minute to stop by our podcast Facebook page! I invite you to Like it and the join the discussion.